The San Francisco Housing Development Corporation (SFHDC) cordially invites you and your friends and family to attend our Autumn Jazz and Blues Benefit Concert, presenting some of the Bay Area’s top performers. The evening opens with Little Wolf and the Hellcats, featuring award winning blues vocalist Malik Shabazz (aka “Little Wolf”), as well as SFHDC’s own David Sobel on piano/keyboards. The extraordinary Kim Nalley and her world-renowned quartet are closing out the evening with a spectacular show. You won’t want to miss this fun evening of music, wine and beer, desserts and fellowship in a beautiful theatre. All of the net proceeds from ticket sales will go towards supporting SFHDC’s affordable housing programs. GET TICKETS TODAY! 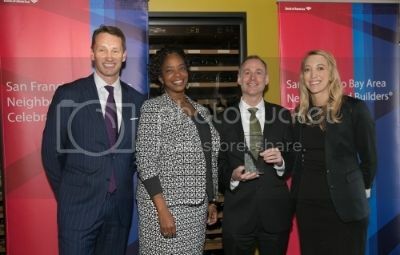 The San Francisco Housing Development Corporation is honored to be a recipient of Bank of America’s Neighborhood Builders Award. Every year the Neighborhood Builders Award is granted to two organizations that have both a positive mission and have made powerful differences in their communities. The organizations who receive this award are gifted with an unrestricted grant as well as leadership training. This $200,000 unrestricted grant will go a long way towards helping SFHDC continue our mission of creating safe and affordable housing in San Francisco and fostering financial independence for members of the community. San Francisco Housing Development Corporation is very honored to receive this award. A huge thank you goes to Bank of America and congratulations to this year’s other Neighborhood Builder recipient, Inner City Advisors. Click HERE to read the full Bank of America press release. Come celebrate yet another year of building homes and hope with SFHDC’s annual fundraising Gala and Auction. The event will take place on Thursday, April 23rd, 2015 at 5:00-10:00PM. The celebration will feature both a live and silent auction, catered reception, comedian, live music, seated dinner, thanking of SFHDC’s board and sponsors, a message from CEO David Sobel, and a wine and cheese reception. Come join in the festivities and support the continued efforts of SFHDC to help low and moderate-income San Francisco residents find safe and affordable housing and obtain the financial education necessary to achieve stability. More information about the event and how to purchase tickets can be found here.